Wow! A 92 year old Frigidaire Refrigerator that still runs! In our modern world, they are everyday items which rarely merit a second glance. But when this fridge was made, it cost more than a car and was the luxury preserve of the very wealthy. The timber-framed model is still going strong after being brought to Britain from the U.S. shortly after the First World War. 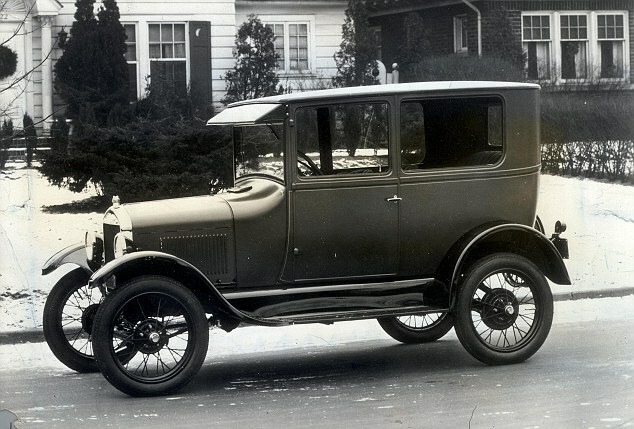 It cost $775 – compared with $450 for a Model T Ford car. Although the fridge’s exact age is unclear, its owner Ian Pasley-Tyler believes it may have been built as far back as 1918, making it 92 years old. What is certain is that his grandfather, British-born entrepreneur Harold Bryant, shipped it here in 1923 after making his fortune across the Atlantic. Either way, it is the oldest known working fridge by a long shot. ‘It still does a fantastic job, just as it was designed to do all those years ago, and it has become a piece of our family history,’ said Mr Pasley-Tyler, 70, a retired banker who is a Tory district councillor. ‘It is very noisy and I am sure it uses loads of electricity but it is incredible that it is still working. 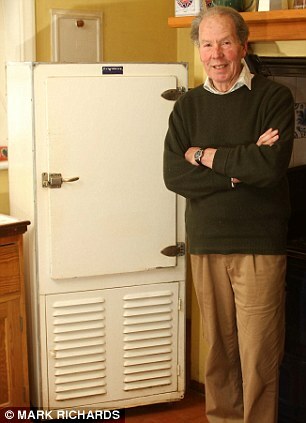 Mr Pasley-Tyler, a father of three, realised his fridge could be the oldest working model in Britain after the Daily Mail told of other owners claiming the title. Last month Doris Stogdale, 89, of Oxford, was still using the 58-year-old General Electric fridge bought when she lived in Malaysia. She was trumped this week by Don and Carol Ashley, whose 63-year-old English Electric model is still working at their home in Cockshutt, Shropshire. 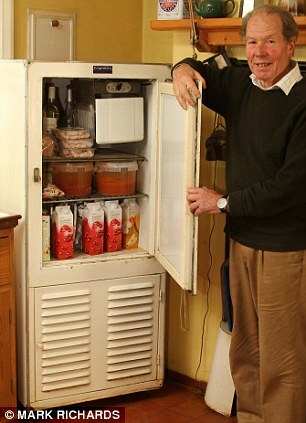 The 5ft tall fridge owned by Mr Pasley-Tyler and his wife Susie, 67, is believed to be one of the first built by makers Frigidaire. It stands at their 17th century manor house, Coton Manor, near Gilsborough, Northamptonshire, and is used for drinks and less perishable food like butter. The fridge was inherited by Mr Bryant’s only child Haroldine, who lived in the house with her husband Henry Pasley-Tyler, and then passed to their son Ian in 1990. Apart from needing new door hinges three years ago, it has never needed maintenance, he said.